Pioneer is one of the most recognizable brands in the car audio market. This shallow mount, preloaded subwoofer is a perfect example of how good Pioneer is when it comes to car audio. It can reproduce clean, clear, and accurate bass. It really kicks hard even if the volume level isn’t set too high. And this subwoofer doesn’t take up a lot of space in your cabin. Although you may be paying more if you get this subwoofer, you can be assured of its good performance and build quality. 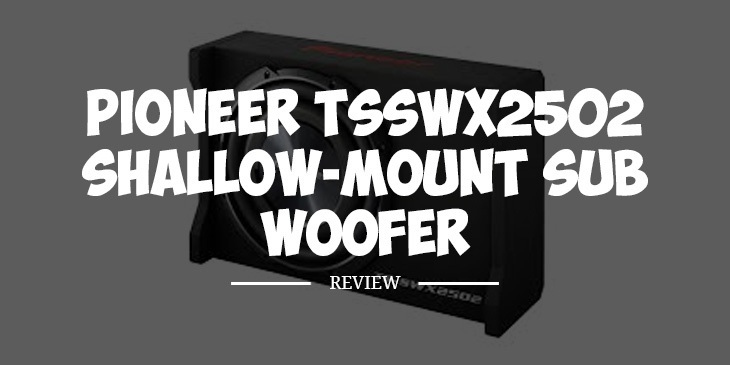 This is one of the top-rated shallow mount subwoofers in the market today. This subwoofer has an innovative design enclosure that allows it to be installed under the car seat, in the trunk or at the back of the seats. With dimensions of18-5/8″ x 13-7/8″ x 6″ (width, depth, and height), this shouldn’t take up a lot of space in the car. It is also fully carpeted, with a non-slip and scratch resistant surface. Due to its design, some passengers may not even realize it is a subwoofer until you turn on the car stereo. Unlike most subwoofers, this Pioneer model has angled push terminals that make it a lot easier for owners to connect speaker wires. This is in stark contrast to traditional subwoofer terminals which are mounted either horizontally or vertically. With angled push terminals, wires are not bent to fit. This is particularly helpful when low gauge, high-performance wires are utilized. Moreover, angled push terminals result to the straighter connection that can save space. This sub has an oversized cone structure, which can affect the quality of the bass produced as it lets more air to move around. The cone itself is very rigid. It is made of high quality, MICA-injection molded resin. It can stay in shape even during the long playing session. Plus, there’s a dual spider housing to provide the cone with more motion control for the more accurate bass response. Car owners buy subwoofers to boost the bass levels of their existing car audio systems. This is subwoofer does that; delivering tight and clear bass without any distortion. When positioned correctly, it can deliver clean bass. Perhaps more importantly, the bass is not too loud to disturb your neighbors. There are two metal L shaped brackets included in the product package with eight self tapping screws. These accessories should help you in installing this sub in your vehicle. It can be mounted to fire downwards, with its feet on the front of the box. This way, you can put things on top of the sub and not worry about damaging the speaker. How long is the warranty period for this sub? Pioneer backs it with a one-year warranty. Is it a single or double voice coil? This is a single voice coil sub. This Pioneer shallow mount subwoofer won’t win any competition for loudness, but if you’re looking for a sub that can make a significant increase in the bass levels of your existing audio system, then you should go for this.